On Saturday, September 24th, individuals and families will kick-off the first weekend of the fall season at Sand Hills Community Wellness Center in Kendall Park, New Jersey! 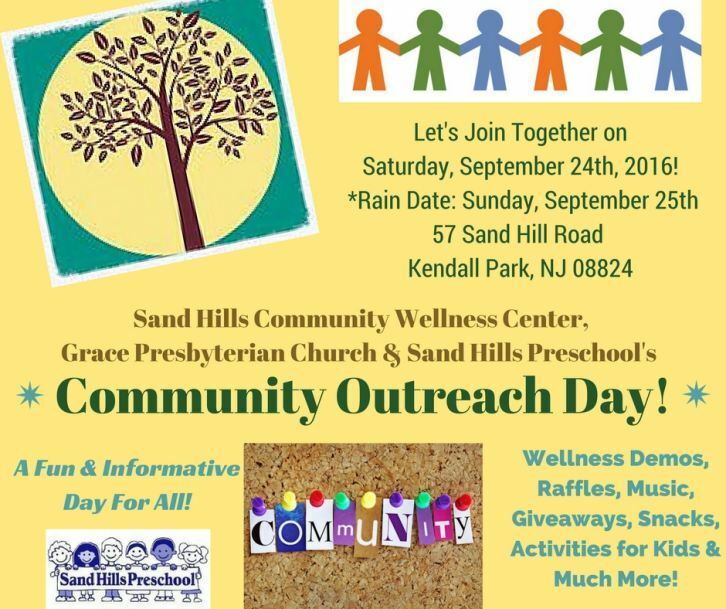 KENDALL PARK, N.J. - Aug. 3, 2016 - PRLog -- On Saturday, September 24th, individuals and families will kick-off the first weekend of the fall season at Sand Hills Community Wellness Center in Kendall Park, New Jersey. The highly anticipated Community Outreach Day will be held from 12:00pm – 4:00pm and will consist of lots of fun for everyone. Practitioner demos, music, food, and giveaways are only a few of the many activities to look forward to at this year's event! Rain date will be scheduled the following day, Sunday, September 25th, 12pm-4pm. What: What better way to welcome the first official weekend of fall than to join together with the community for a day full of fun? Free and open to the public, attendees can look forward to learning about the different programs offered at the wellness center, as well as experience some of the facility's services first hand. Practitioner demos that will take place during the Community Outreach Day include: Judo, Chair Yoga, Meditation, Chair Massage, Healthy Cooking, Reiki, and Yoga by Integral Yoga Institute Princeton. Having the opportunity to take part in the demos will be a unique way for interested participants to gain an understanding of what these beneficial classes and programs entail. Several professionals from the center will be in attendance to answer questions such as; Director of Sand Hills Community Wellness Center, Maryann Rappa, Melissa Edwards from City Kidz World's Educational Program, and Allie O'Brien from The Garden State Community Kitchen and The Supper's Program. This four-hour Community Outreach Day will allow guests to mix and mingle, enjoy great music and snacks, and participate in a raffle for a chance to win an awesome prize. There will be free giveaways for attendees too! In addition to the wellness center, Sand Hills Preschool and Grace Presbyterian Church will also have tables displayed for their organizations and representatives available to speak with. Parents can inquire about Sand Hills Preschool and learn what this reputable school can offer their family while children enjoy exploring the schoolyard's playground. The community can hear all about Grace Presbyterian's welcoming and inclusive congregation as well. Interested in attending Community Outreach Day? Be sure to join the event's Facebook page in order to stay up-to-date with information regarding this informative and fun-filled day! About Sand Hills Community Wellness Center: Though collaborative relationships with individual practitioners, organizations and businesses, we strive to fulfill our Mission Statement: To reach out to the community by providing programs and services that enhance the growth of mind, body and spirit. With little overhead costs, practitioners can provide services and programs to people who either can not afford those services, or for whom these services are not readily available. In other words, a core component of our vision is to serve people who are undeserved or overlooked. We continually supplement our ongoing programs with new classes and workshops. For the most up-to-date information on class offerings and scheduling, please visit our website often and follow us on Facebook. Learn more at: http://sandhillswellness.wix.com/sandhillswellness. The Non-Profit Sand Hills Community Wellness Center Celebrates 5 Years! Sand Hills Community Wellness Center Along With The GSCK at the Mid-Summer Marketing Showcase!